Oil on panel, 57 x 72 cm. Time appears to have stopped in this place, where stillness follows decay. The dilapidated, old grey watermill is no longer in use; there is no rushing water. 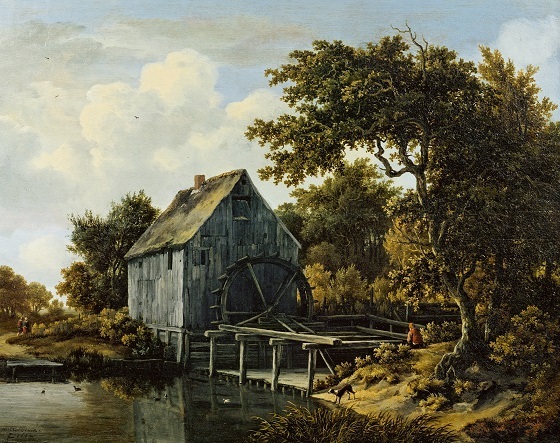 A man with his back turned sits lost in thought and at the far left, a couple walks behind the watermill. Along with a barking dog and a startled duck, these are the only elements of movement in this picturesque scene. Whether the old water mill should be interpreted as a symbol for the passage of time and the transience of life, or if it is simply an expression of a romantic notion of the beauty of decay, is up to the individual to decide. Hobbema repeated the watermill motif more than thirty times throughout his oeuvre. Hobbema trained at the workshop of Jacob van Ruisdael, studying northern landscape painting in particular, which would later become his primary genre. He was directly inspired by his master in a number of works, including his many watermill paintings from the 1630s. Hobbema’s style was imitated by his contemporaries, but it was not until the end of the 1800s that interest was truly spurred, largely thanks to Romantic landscape painters such as the English William Turner and John Constable.